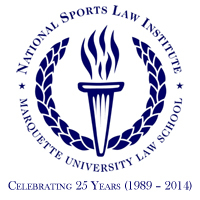 Each year, the National Sports Law Institute of Marquette University Law School reproduces an Annual Survey of Recent Developments in Sports Law. This survey provides an overview of important cases and arbitration decisions that have been resolved in the past year. The survey is initially published in the spring issue of the Marquette Sports Law Review, and is then included on this website. This website contains links to past versions of the Annual Survey (published first in 2003), along with links to issues of the now discontinued publication You Make the Call. . . a semi-annual newsletter published from 1998 until 2011. The newsletter analyzed the most recent cases in the sports law field.